After you're finished using an Excel workbook, use any of these methods to close it and free up the memory it uses. (If you haven't saved it since the last time you made any changes, you are prompted to do so). ► Choose File ► Close from the menu bar. ► Click the Close button in the workbook's title bar on the far right side (or on the menu bar if the workbook is maximized). ► Double-click the Control button in the workbook's title bar at the far left side (or on the menu bar if the workbook is maximized). ► Press CTRL + F4 on the keyboard. ► Press CTRL + W on the keyboard. press the SHIFT key and choose the File ► Close All command from the menu bar. This command only appears when you hold down the SHIFT key while you click the FILE menu. Excel closes each workbook, prompting you for each unsaved workbook. When you no longer need an Excel workbook file, you may want to delete it from your disk to free up space and reduce the number of files displayed in the Open dialog box. You can delete files using standard Windows techniques, or you can delete files directly from Excel. 1. Use either the File ► Open command from the menu bar, OR the File ► Save As command from the menu bar. 2. 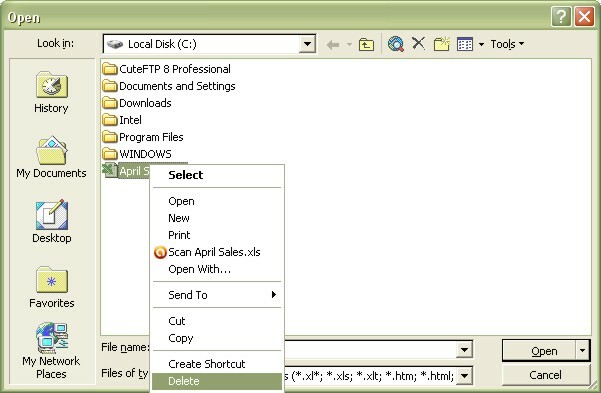 Right-click a filename that you want to delete and choose Delete from the shortcut menu. 3. When you're asked to confirm the deletion, click Yes. If your system is set-up to use the Recycle Bin, you may be able to recover a file that you deleted accidentally. Before you empty the Recycle Bin, open it and drag out any items you wish to save.